So in honor of this “1st” International Sushi Day, of course I have to bring you all a sushi recipe. Because though I know most of you will celebrate by going out for sushi (anyone want to help me convince Son to take me out for sushi tonight? ;)), I’m sure there are at least a few of you who might want to try making sushi at home. So for you, the Red Dragon Roll – my favorite combination of tuna and avocado, with the added coolness of the cucumber to counteract the burning spice of the Sriracha sauce, and the crunchy combination of nutty sesame seeds, salty tobiko, and added umami from the fried onions on top. 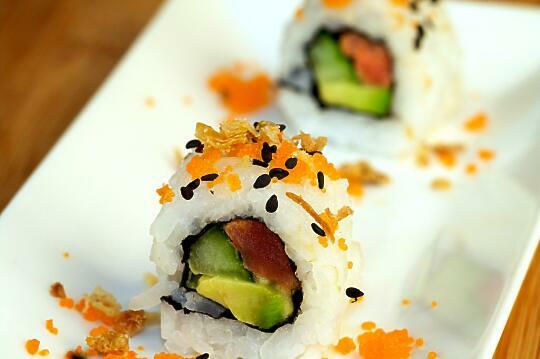 Have a wonderful 2nd 1st International Sushi Day! 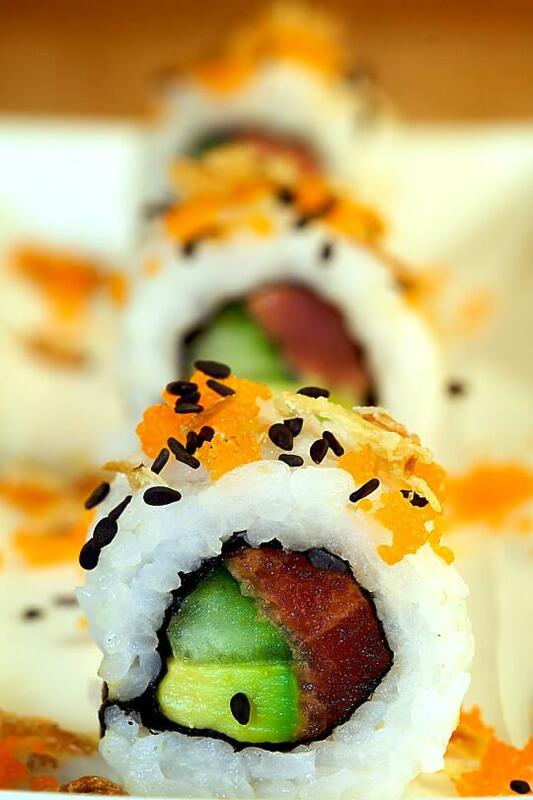 Roll the sushi inside-out, using some tuna, avocado, cucumber, and a thin line of Sriracha sauce as your fillings. Sprinkle the tobiko, fried onions, and black sesame seeds on top. Happy 1st International Sushi Day Again! I am a sushi lover and am looking forward to forcing my DH, albeit nearly at gunpoint, to take me out to my fav Sushi Bar today! Hoping they have a special running. Enjoy your day! If I’d known today was International Sushi Day, I would have saved my first sushi making adventure for today instead of yesterday. Oh well. I just found this blog yesterday. Good show. I didn’t get this post in email until after dinner but coincidentally, I DID have sushi for dinner so Happy International Sushi Day. I had yummy vegetable rolls but that did not stop me from drooling at the sight of your photos. You really are an artist! Do you fry the onions that you put on top or do you buy the bags from asian grocery stores? I just ran across this site….love it! Beautiful recipes and beautiful photos. Hey Allison, that looks super delish! The second picture is killing me, and now I have an insatiable craving!! Great sushi blog, thanks for sharing your recipes! I wish I would of found your site this weekend!!! I bought sushi grade tuna and wanted to make rolls, but was unsure of what. I have a question, I am having trouble with my rice. It is either to soft or still has a bit….How do I make that perfect rice? I am who left a comment under anonymous…sorry. The Red Dragon Roll really looks great. To Miranda comment 11— I highly recommend a rice cooker… perfect rice 100% of the time! Use good quality rice as well. We like jasmine rice. Convert the cooked rice to “sushi rice ” by lightly tossing it with a mixture of rice vinegar, sugar & salt that has been heated to dissolve and cooled to add to the cooling rice. Lift rice to cool it… don’t stir to avoid making it mush! hi. i’m violet, i,m from mexico, this site is great, and the food look delicious, i’d like to learn a cooking similar food, help me! I made this at the sushi restaurant i work at for 2 customers and they loved it! I think it was the fried onions that got them haha. We use that in our soup luckily i had them on hand. Never thought of putting fried onions on sushi. Thanks for the great idea.